Track List:BLACK & WHITE REHEARSAL.SET 1:SOMETIMES I DON'T KNOW WHAT TO FEEL.REAL MAN.I SAW THE LIGHT.SET 2:HELLO IT'S ME.DO YA.LOVE IS THE ANSWER (TWO PARTS).COULDN'T I JUST TELL YOU.A DREAM GOES ON FOREVER.JUST ONE VICTORY.TWO TUNES OF JAMS WITH DETROIT BETTY LAVETTE. Track List:LOVE OF THE COMMON MAN.RUNNING BEAR. I DON'T WANT TO TIE YOU DOWN.THE WALLS CAME DOWN.BANTER-BLACK AND WHITE.ARE YOU HAVIN' ANY FUN.ENDLESS PRAIRIE.I'M A GUN.SONG OF THE VIKING. (CUTS IN) COMPASSION.THE MEANING OF LIFE.DIRTY OLD EGG SUCKING DOG.CLICHÉ.LYSISTRATA.I SAW THE LIGHT.HASH PIPE.HELLO IT'S ME.LOVE IN ACTION (CUTS OUT). (CUTS IN) LOVE IN ACTION FINISH. ONE WORLD. Track List:GOD OF LOW.WATCHING THE WORLD GO BY. I JUST WANNA TOUCH YOU.THERE GOES MY INSPIRATION.LIBERTINE.THE UP.TOO MUCH ON HER MIND.SWEET LITTLE ACCIDENT.THE CLOCKS ALL STOPPED.MAYBE I COULD CHANGE.YELLOW CAB.LOVE ALONE.CLICHÉ.GODZILLA.ONE SURE THING.LYSISTRATA.LADY MADONNA.SET ME FREE. Track List:COME.TRUTH.EVRYBODY.RISE.LOOK AT ME.SIR REALITY.DEAF EARS.LET'S DO THIS.BUFFALO GRASS.STRIKE.SECRET SOCIETY.THIS IS NOT A DRILL.TIN FOIL HAT.BEGINNING (OF THE END).LOVE SCIENCE.SWEET.PARTY LIQUOR.PAST.CHANCE FOR US.NO WORLD ORDER.BUY MY T.GOD SAID.ONE WORLD.HELLO IT'S ME.JUST ONE VICTORY. Note:Heywood (from TTD) says, "A nice change up in the set list this year. Not a greatest hits show at all. Also a nice move is the swing beat on that tired old gem Hello it's Me. Binko buys a shirt at every concert he goes to, then puts them in a drawer never to be worn again. He has brand new shirts going back to the 70s. Apparently this is acceptable to Todd, because he says in Buy My T "you can bootleg the music but you have to buy a shirt". Ok, Todd. I will, and I will." Recording lineage: Taper: Binko. Gear: Tascam DR-08. Transferred & mastered by Heywood. Lineage: DR-08 (recording to .wav @ 24/96) > USB > Adobe Audition 1.5 (EQ, peak limiting, splits & fades) > Xrecode II (conversion to 16/44.1) > TLH (sector alignment, flac 8). Track List:CROWD INTRO.COME.TRUTH.EVRYBODY.RISE. LOOK AT ME.SIR REALITY.DEAF EARS.LET’S DO THIS. BUFFALO GRASS. IN BETWEEN STUFF .STRIKE.SECRET SOCIETY.THIS IS NOT A DRILL.TIN FOIL HAT (VIDEO).THE BEGINNING OF THE END.LOVE SCIENCE.SWEET.PARTY LIQUOR.PAST. CHANCE FOR US.NO WORLD ORDER. BUY MY T.GOD SAID. -BREAK-.ONE WORLD.HELLO I’TS ME.JUST ONE VICTORY.BONUS: ENTIRE SHOW (ONE MP3 TRACK). Note:Finally an audience recording of This Chival Rock Tour. Tjen0721 (Thom) is aces! Actually the first recording of the year (Well...besides my boring stitched Together 2017-03-17 ‘Unpredictable’ City Winery New York NY http://forum.trconnection.com/viewthread.php?tid=11472). What a great capture Thom! They changed the set list order a bit, and we get 'sir Reality' which not surfaced on any Fan Film that I know of. What's cool is: We also have e- review from Thom Jennings in 'Backstage access! : "Midway through Saturday’s performance in Kingston, New York, Todd Rundgren mentioned to the crowd he had become a doctor earlier in the day. He was, in fact, given an honorary doctorate from the Berklee School of Music that afternoon and delivered the school’s commencement address. Rundgren cited the decision to make “A Wizard a True Star” after the hugely successful “Something/Anything?” as the pivotal point in his career. “Wizard” has subsequently been cited as an influential work by many contemporary artists, and amongst the Rundgren Nation, it is considered Rundgren’s career defining work. Fast forward to 2017 and we find Todd Rundgren flanked by two young dancing girls in front of two layers of state-of-the art video screens, one sandwiches a powerful band, and Rundgren is out promoting a new album. In short, more than four decades after Todd gave the world “A Wizard a True Star” he still chooses to challenge himself and his fans, new and old alike. The Chivalrock Tour, in honor of his newest release “White Knight,” is the reconciliation of what Todd has been doing since the end of his tenure as a Bearsville recording artist. The show presents three sides of the musician, starting with the modern EDM infused Todd, followed by guitar hero Todd and finishing with the Philly soul funky Todd who can make you want to dance. It isn’t until the encores that Todd performs a single song from his Bearsville years, and even those three oldies are polished up. Kingston is a stone’s throw away from where Rundgren recorded his Bearsville catalogue. In essence, this was a fascinating homecoming for the artist who has always refused to stand still. In addition to being a visually breathtaking and bombastic, musically it may be the most cohesive presentation of Rundgren’s latter catalogue that combines all the great elements of the last three solo tours, including band members. While some fans have had a hard time accepting the band behind a semi-transparent video wall, the band’s playing has not suffered at all. Prairie Prince and Kasim Sulton have become one of the best powerhouse rhythm sections around, Jesse Gress is playing with incredible conviction and Greg Hawkes brings it all together with his versatility and pop sensibility. What makes a live show great is the artist’s ability to take a studio recording to the next level, and Rundgren’s band has done that incredibly well, especially on the songs from the last three studio albums. For those who might be scared off by the notion that Todd is not playing the older material on this tour, the way the show is structured you manage to get all the elements of those great songs in an updatedform. So while there is no “Bang the Drum” you get the party anthems “Evrybody” and “Party Liquor,” and instead of “Love in Action” you get songs like “This is Not a Drill” or “Strike” and even without “ISaw the Light” there is the delightful new pop gem “Let's Do This,” and while “Love is the Answer” is absent “Past” is an equally moving song. Perhaps most important is that Todd not only is winning over his audience, he seems to be having a great time. The show is well crafted and the “Global” girls from the tour of the same name bring not only added strength to the backing vocals, they infuse a youthful energy into the show. 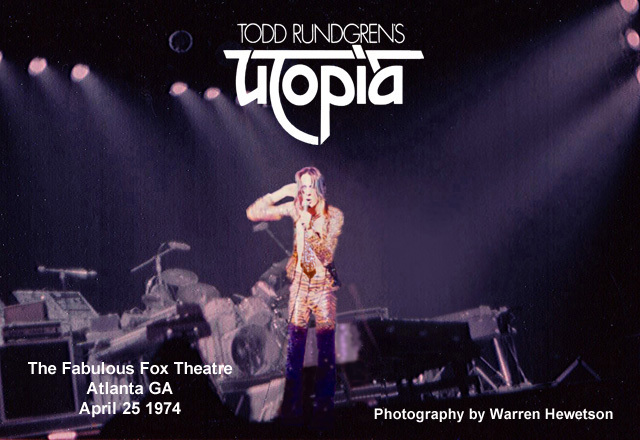 If you plan on taking a date and talking through a “White Knight” show you should probably stay home, but if you want to relive some great moments from Todd’s career in a new package then you will be fully entertained and satisfied, which is just what the Dr. Rundgren ordered." Track List:DISC ONE:(FADES IN )COME.TRUTH.EVRYBODY.RISE.LOOK AT ME.SIR REALITY.DEAF EARS. LETS DO THIS.BUFFALO GRASS.STRIKE.SECRET SOCIETY.THIS IS NOT A DRILL.TIN FOIL HAT(VIDEO).BEGINNING (OF THE END).LOVE SCIENCE.DISC TWO:SWEET.PARTY LIQUOR.PAST.CHANCE FOR US.NO WORLD ORDER.BUY MY T.GOD SAID.ONE WORLD.BAND INTRODUCTIONS .HELLO ITS ME.JUST ONE VICTORY. Track List:WOULD BE THE WHOLE VIDEO WHICH IS OMITTED HERE, DUE TO IT'S RUN TIME (AN HOUR), SIZE OF FILE, AND PRETTY MUCH OF IT WORTHLESS SILLINESS.2017-05-30 FISH CENTER (ATLANTA STUDIO) 'LONESOME PRAIRIE'(VIDEO).2017-05-30 FISH CENTER (ATLANTA STUDIO) 'LONESOME PRAIRIE'(SOUNDTRACK).2017-05-30 FISH CENTER (ATLANTA STUDIO)' RUNNING BEAR'(VIDEO).2017-05-30 FISH CENTER (ATLANTA STUDIO)' RUNNING BEAR'(SOUNDTRACK).2017-05-30 FISH CENTER (ATLANTA STUDIO)' 'LET'S DO THIS'(VIDEO).2017-05-30 FISH CENTER (ATLANTA STUDIO)' 'LET'S DO THIS'(SOUNDTRACK). Track List:COME.TRUTH. EVRYBODY.RISE. LOOK AT ME. SIR REALITY. DEAF EARS FALSE START.DEAF EARS FULL.LETS DO THIS.BUFFALO GRASS.STRIKE.SECRET SOCIETY.THIS IS NOT A DRILL.TIN FOIL HAT.BEGINNING (OF THE END). LOVE SCIENCE.SWEET.PARTY LIQUOR.PAST.CHANCE FOR US.NO WORLD ORDER.BUY MY T.GOD SAID.ONE WORLD.HELLO ITS ME.JUST ONE VICTORY. Note:Mike Mosner. Moss the Boss. Dependablest of all dependables. I'm getting me one of those Jordan's 'I LIKE MIKE!' T-Shirts! Here's one damn good audience recording from 2017-05-30 Center Stage Atlanta. Moz deserves a medal! And wear a cape! You should ya hear this baby! All I did was raise the levels a hair. Now, you're going to hear a wee teeny (very weeny) distortion from Todd's mike in [u]one or two[/u] of these tunes. But it ain't the taper. It's Todd's mike. I ain't no pro-musician, but I wish he'd lose that 1950s looking thing. Everything I've heard from these shows (Vimeo, Private phone vid,YouTube etc...) is the same. Everything sounds great but then the distortion from his mike. (The 'STATE" Webcast was like that too).Global Girls & Band's mikes sound fine. Track List:DISC ONE: CROWD.COME.TRUTH. EVRYBODY. RISE.LOOK AT ME. SIR REALITY.DEAF EARS. LETS DO THIS.BUFFALO GRASS. STRIKE. SECRET SOCIETY. THIS IS NOT A DRILL.DISC TWO: TIN FOIL HAT.BEGINNING (OF THE END).LOVE SCIENCE. SWEET. PARTY LIQUOR. PAST . CHANCE FOR US. NO WORLD ORDER. BUY MY T.GOD SAID. ONE WORLD.HELLO ITS ME. JUST ONE VICTORY. EXTRA APPLAUSE.CROWD. Track List:COME.TRUTH. RISE.SIR REALITY.THE IKON.BUFFALO GRASS.THIS IS NOT A DRILL.PARTY LIQUOR.PAST. BUY MY T. ONE WORLD. HELLO IT'S ME. JUST ONE VICTORY . Track List:COME (FADES IN).TRUTH. RISE.SIR REALITY.THE IKON.BUFFALO GRASS.THIS IS NOT A DRILL.PARTY LIQUOR.PAST.BUY MY T.ONE WORLD.HELLO IT'S ME.JUST ONE VICTORY. Track List:COME.TRUTH. RISE. SIR REALITY. THE IKON. BUFFALO GRASS.THIS IS NOT A DRILL.PARTY LIQUOR .PAST. BUY MY T. ONE WORLD. HELLO IT'S ME. JUST ONE VICTORY. Track List:COME.TRUTH.RISE.SIR REALITY.IKON.BUFFALO GRASS.THIS IS NOT A DRILL.PARTY LIQUOR.PAST.BUY MY T.ONE WORLD.BAND INTROS/HELLO IT'S ME.JUST ONE VICTORY. Track List: ENDLESS PRAIRIE. (CUTS IN) CLICHE'. LOVE OF THE COMMON MAN. (CUTS IN) LET'S DO THIS. I'M GONNA BE (500 MILES). BORN TO SYNTHESIZE. (CUTS IN) A DREAM GOES ON FOREVER . Track List:HELLO IT'S ME.UNDER THE ICE. Track List:MATCHBOX.IT DON'T COME EASY. WHAT GOES ON. I SAW THE LIGHT. EVIL WAYS.ROSANNA.KYRIE.BANG THE DRUM ALL DAY.BOYS. DON'T PASS ME BY. YELLOW SUBMARINE.BLACK MAGIC WOMAN-GYPSY QUEEN.YOU'RE SIXTEEN.BACK OFF BOOGALOO.YOU ARE MINE.AFRICA.OYE COMO VA.I WANNA BE YOUR MAN. LOVE IS THE ANSWER.BROKEN WINGS.HOLD THE LINE.PHOTOGRAPH.ACT NATURALLY.WITH A LITTLE HELP FROM MY FRIENDS. Note:Nice capture of Ringo's show at the Winstar Casino. Taper was in Section A Row 10, so we get less of a distance large venue acoustics. One of the better Ringo’s Allstars audience recordings. The All Starr band has been the same for about 6 years which also means the setlist has been the pretty much the same as well with just a few minor changes. But you can tell these guys like playing together and were having a good time.~ Warren. Track List:MATCHBOX.IT DON'T COME EASY.WHAT GOES ON.I SAW THE LIGHT.EVIL WAYS. ROSANNA.KYRIE.BANG THE DRUM ALL DAY.BOYS.DON'T PASS ME BY.YELLOW SUBMARINE.BLACK MAGIC WOMAN/GYPSY QUEEN.YOU'RE SIXTEEN.BACK OFF BOOGALOO. YOU ARE MINE.AFRICA.OYE COMO VA.I WANNA BE YOUR MAN.LOVE IS THE ANSWERBROKEN WINGS.HOLD THE LINE.PHOTOGRAPH.ACT NATURALLY.WITH A LITTLE HELP FROM MY FRIENDS.GIVE PEACE A CHANCE. Note:A wonderful audience recording, but Recorder says they were 11 Row Center. But this is another one that sounds a great distance away. If I were to chose one I’d stick with the 11/14/17 Thackerville reording. Track List:DISC ONE:COME.TRUTH.EVRYBODY.RISE.LOOK AT ME.SIR REALITY.DEAF EARS.LET'S DO THIS.BUFFALO GRASS (FALSE START).BUFFALO GRASS.STRIKE.SECRET SOCIETY.THIS IS NOT A DRILL.TIN FOIL HAT.BEGINNING (OF THE END).LOVE SCIENCE.DISC TWO:SWEET.PARTY LIQUOR.PAST.CHANCE FOR US.NO WORLD ORDER.BUY MY T.GOD SAID.ONE WORLD.HELLO IT'S ME.JUST ONE VICTORY. Note: At first I was real disappointed in this one. Binko (Traders Den) usually comes up with some powerful audience recordings. But this one was a little flat. BUT then, I edited it with my Roxio Realizer and this thing is now probably one of best recordings from the tail end of 2017! ”The iconic Todd Rundgren returned to the area Monday evening as he played the Rapids Theatre in Niagara Falls. It had been just six months since his prior visit in May. The show was just the 2nd date of his 2nd leg of the White Knights tour. Although the shows were different legs of the same tour there were many differences between them. In other words, anyone who decided to sit through the show again may have enjoyed it even more so this time around. If you missed both shows shame on you. The most noticeable difference was the annoying screen that Rundgren and his “Global Girls” sang in front of while the band played on from behind was gone. Wise choice because the talent behind that curtain deserved to be seen. The same cast was on hand this time as well. The band featuring Cars keyboardist Greg Hawkes, The Tubes drummer, Prairie Prince, guitarist Jesse Gress and bassist Kasim Sulton seemed to play with more authority than they did behind “steel curtain”.The band took to the stage with the exact set they played some six months ago. It was a little surprising since Rundgren had just done a few “unpredictable” shows in which he mixes up the set nightly with Utopia rarities, covers and his solo material. While the majority of the set focused on some of his newer music, Rundgren did some songs that have become standards in his sets such as “Buffalo Grass”, “Love Science” and the show finale “Just One Victory”. Track List:COME.TRUTH. EVRYBODY.RISE.LOOK AT ME.SIR REALITY.DEAF EARS.LET’S DO THIS.BUFFALO GRASS.STRIKE.SECRET SOCIETY.THIS IS NOT A DRILL.TIN FOIL HAT.BEGINNING (OF THE END). LOVE SCIENCE.SWEET.PARTY LIQUOR.PAST.CHANCE FOR US.NO WORLD ORDER.BUY MY T.GOD SAID.ONE WORLD.HELLO IT’S ME (WITH BAND INTRODUCTIONS).JUST ONE VICTORY. 11/29/17 'WHITE KNIGHT/CHIVALROCK' MARYLAND HALL FOR CREATIVE ARTS ANNAPOLIS MD AUDIENCE MARC L.
Marc says, "I recorded this show from second row just off center.I like that there is almost no crowd chatter, but I wish Todd’s mic worked all night"
Track List:COME.TRUTH.EVRYBODY.RISE.LOOK AT ME.SIR REALITY.DEAF EARS/LET'S DO THIS.BUFFALO GRASS.STRIKE.SECRET SOCIETY.THIS IS NOT A DRILL.TIN FOIL HAT.BEGINNING (OF THE END).LOVE SCIENCE.SWEET.PARTY LIQUOR.PAST.CHANCE FOR US.NO WORLD ORDER.BUY MY T.GOD SAID.ONE WORLD.HELLO IT'S ME.JUST ONE VICTORY. Track List:DISC ONE: HELLO THERE. LOVE OF THE COMMON MAN.BIG WEEKEND.CLICHÉ.THE WALLS CAME DOWN.RUNNING BEAR.BIG BOPPER TALK/CHANTILLY LACE.I DON'T WANT TO TIE YOU DOWN.INCENSE AND PEPPERMINTS.ARE YOU HAVING ANY FUN.BLACK & WHITE. I SAW THE LIGHT. HASH PIPE.TOO FAR GONE. DISC TWO: ENDLESS PRAIRIE.I'M A GUN (LORNE GREEN TAPE).THERE GOES MY INSPIRATION.BLOW ME. LYSISTRATA.KIND HEARTED WOMAN.BORN TO SYNTHESIZE.GOOD TIMES ROLL.I'M GONNA BE (500 MILES).LYSISTRATA.HELLO IT'S ME.APPLAUSE/BAND INTROS/THE MEANING OF LIFE.ONE WORLD. Track List:DISC ONE:CROWD.COME.TRUTH.EVRYBODY.RISE.LOOK AT ME.SIR REALITY.DEAF EARS.LETS DO THIS.BUFFALO GRASS.STRIKE.SECRET SOCIETY.THIS IS NOT A DRILL.TIN FOIL HAT. BEGINNING (OF THE END).LOVE SCIENCE.DISC TWO:SWEET.PARTY LIQUOR.PAST.CHANCE FOR US.NO WORLD ORDER. BUY MY T.GOD SAID.ENCORE APPLAUSE. ONE WORLD.BAND INTRO.HELLO IT’S ME.JUST ONE VICTORY.APPLAUSE.